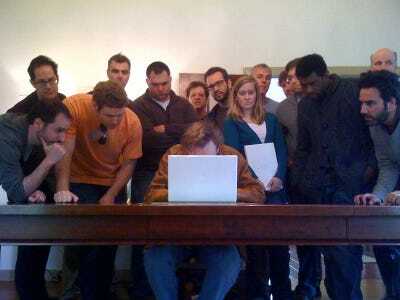 Conan’s staff hover over their leader. Conan O’Brien isn’t going to be pocketing cash by selling those $500 premium tickets to his comedy tour.He just wants his former Tonight Show staff of 40 to get paying jobs again, according to TMZ. The Legally Prohibited From Being Funny On Television Tour includes 30 dates, with ticket prices ranging from about $695 (for the Meet & Greet package) to about $40, which would bring in a nice price for his staffers. The show is also sponsored by American Express. Meanwhile, Conan’s team is adding shows since tickets are selling so well. TeamCoco.com was jammed with traffic yesterday, so the site has been down a few times. Head to Ticketmaster if you’re looking for tickets. Conan got a $32.5 million exit deal from NBC, and negotiated hard for his staff to get additional severance pay from the network. Conan’s full Tonight Show crew included about 200 people, and the network agreed to pay $12 million total in severance. After they were out of the negotiation weeds, Conan also reportedly paid his staff six-week severance out of his own pocket.